Money-saving, time-saving, easy-to-use construction materials estimating calculator. This material estimator calculator is designed for contractors, trades people and estimating professionals who need to estimate materials and costs for concrete, fences, decks, bricks, tile, flooring, gravel, painting, drywall and paneling and more. It helps users quickly and easily calculate material costs and allowances and get exactly the materials they need. Reducing estimating errors will save time and money. 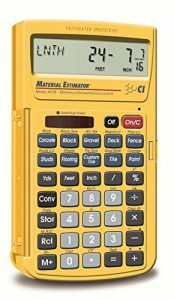 Calculated Industries Material Estimator Calculator is designed to give quick linear, area and volume solutions and conveniently displays results in inches, fractions, yards and metric for easy, hassle-free use. Calculator finds quick and accurate stud material requirements for 4x8, 4x9, 4x10 and 4x12 sheets. Features a board feet and cost per unit functions estimating material cost instantly, built-in answers for material and spacing with the ability to calculate material cost and allowance using cost and percent functions. Calculator displays 11 digits, 7 normal and 4 fractions making it simple to read minimizing mistakes. Containing full annunciators, calculator includes protective 360 degree hard cover door, quick reference guide, pocket reference guides in English and Spanish with a one year limited warranty. One CR-2016 long life battery required for use. Save time and money by reducing estimating errors with the Materials Estimating Calculator (model 4019) from Calculated Industries. You'll be able to quickly and easily calculate material costs and allowances and get exactly the materials you need. 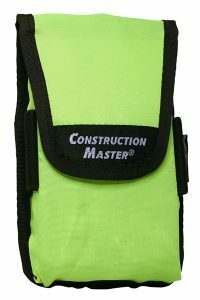 It's designed for contractors, trades people and estimators who need to estimate materials and costs for concrete, fences, decks, bricks, tile, flooring, gravel, painting, drywall, paneling, and more. You'll be able to accurately find material requirements for studs, 4x8, 4x9, 4x10, 4x12 sheets, board feet, floor tiles, blocks, bricks, gravel, and paint, as well as calculate material costs and allowances using cost and percent functions. Some examples include calculating the number of standard 8-inch bricks for both face and paver applications, the number of needed concrete bags (in either 40-, 60-, or 80-pound quantities), and the number of tiles needed based on area and grout width. It works directly in yards, feet, inches, fractions, and meters, including square and cubic formats no need to convert to decimals. Store your measurements to instantly get accurate material estimates for your jobs and projects. Very handy, replaced a older model we had use for years. Tip - do not put in your back pocket & then sit on it, you will break the cover/hinges!! This calculator saves a lot of time and trouble. The only reason I didn't give this a 5 start rating was the instructions. They are very ambiguous at best. Fortunately YouTube has quite a few of these figured out from video. What is 25 feet 7 inches divided by three? Of course you could do this calculation by hand - 25 feet times 12 plus 7 divided by three, then convert back to feet/inches, but this thing does it with a few clicks, and is accurate, and has a scrolling memory so it is it wins out over the manual method. 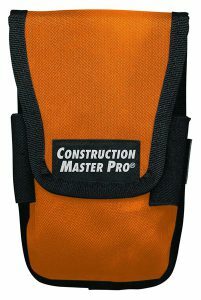 It also does many other calculations and has a handy pouch for the manual and a integrated cover to protect it from dirt and spills. The yellow case is a nice touch so you can find it quick in a pile of tools. I use this calculator every day. A boss at a previous job bought me my first one, but I had to leave it behind when I changed jobs. Of course I immediately bought an identical one. Sure you can get a phone app that does the same things, but this is much more handy than a touch screen in a dirty greasy filthy dusty shop environment. And you can actually press the buttons with shop gloves on. I use this for woodworking. 15" 3/8 cut in half? No problem with this. It's also easy to account for the blade size to get two equal sized cuts off a single piece of wood. Highly recommend. The case keeps the face and buttons sawdust free. I picked this over others since it has a solar option unlike some of the higher end ones.